In her essay, Ravisha writes about 'making cleanliness our religion'. 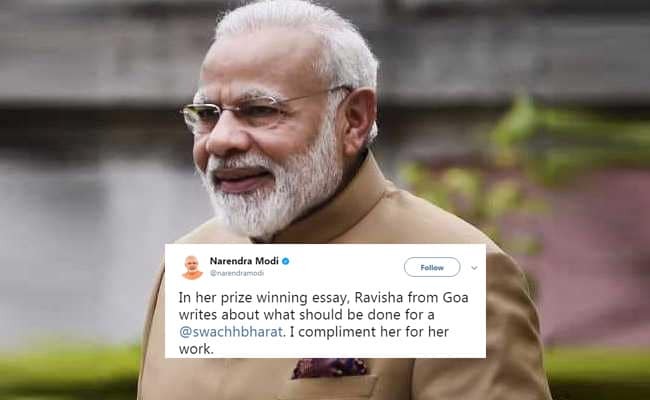 In a tweet posted last evening, Prime Minister Narendra Modi praised a class nine student from Goa for her essay on ways to keep India clean. His tweet, posted some 17 hours before writing this, has collected over 9,000 'likes' and more than 2,000 retweets so far - and still counting. "In her prize winning essay, Ravisha from Goa writes about what should be done for a @swachhbharat. I compliment her for her work," says PM Modi on Twitter. His post is accompanied with pictures of the Fatima Convent High School student's essay titled 'How Can I Make India Clean'. In her essay, Ravisha writes about 'making cleanliness our religion' and shares ways in which citizens can make clean India a reality. The essay has been widely praised on Twitter. "Handwriting is also good. Congratulations Ravisha for receiving recognition from our beloved PM," says one Twitter user on PM Modi's tweet. "Congratulations... we need more such children to make our country clean," says another. During the 36th edition of Mann Ki Baat yesterday, PM Modi appreciated all those who have contributed towards making the 'swachh' mission a success.